Ambience is the word that crops up often in conversations about the antebellum city of Charleston, South Carolina. No place in Charleston exemplifies the ambience of the old city more than the one-hundred-year-old Carrington-Carr home, now an inn at Two Meeting Street. It is a summer afternoon and a cool glass of tea has been set out on the west end of the veranda for the thirsty sightseer in from touring the old city. Except for the muted sound of motor cars on Meeting and Battery Streets, the scene could have easily been lifted from the nineteenth century. 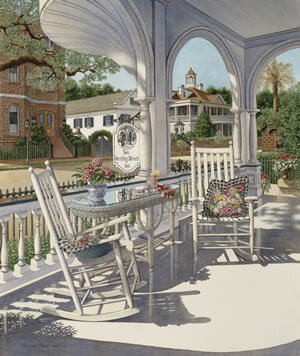 "Afternoon Tea" is the third of Dempsey's paintings which look outward from the Two Meeting Street Inn. In this view he has included, in the foreground, the entablature which supports an overhanging second story room. Dempsey has used the same color palette throughout the three 'Veranda' paintings and has adhered to the same scale so that the paintings can stand alone as the excellent pictures the are or they are or be hung together to form a stunning triptych. Visitors to Charleston, South Carolina fortunate enough to get lodgings at the historic old Carrington-Carr horne at Two Meeting Street can bask in the ambiance of the city without ever leaving the premises. The house itself, from the Louis Comfort Tiffany stained glass windows to the lovely old veranda with its double columned arches framing an unsurpassed view of the harbor across White Point Gardens and the period houses along Battery Street, is the embodiment of antebellum Charleston. Guests at Two Meeting Street Inn might spend the morning at the city museum, which is the oldest in the country, or perhaps take the boat trip out to historic Fort Sumter. Then, before a walking tour of the old city, they might pause first for a mid-afternoon tea break on the west veranda where the slow pace of sightseeing carriages and a light breeze through the palm trees, lend a timeless atmosphere to the scene. Dempsey first watercolor from the vantage point of the Meeting Street address was "View From the Veranda". This was followed by a year later by "Morning Coffee" which expanded the view to include the east side of the veranda and a spectacular old live oak with the harbor in the distance. Now, with "Afternoon Tea," Dempsey completes the panoramic sweep with a vista from the west end of the veranda showing some of the old houses and palmetto palms along Battery Street. "Afternoon Tea," like the other two paintings in the trio, stands on its own as a masterful work, worthy of any Dempsey Essick setting of location. Dempsey has used the same color palette and has adhered to the same scale for each of the "Veranda" paintings which permits a stunning triptych display when the three are hung together. Together or separately, "View from the Veranda", "Morning Coffee", and "Afternoon Tea" comprise a tribute by the artist to one of the most beautiful cities in America. Plan your stay at Two Meeting Street Inn where Afternoon Tea is graciously served by the Spell Family.